Boarding the Trans-Manchurian train in Ulaanbaatar, we immediately noticed a marked improvement from the elderly Mongolian rolling stock in which we had trundled across Siberia. This time, we had been allocated a proper first class carriage with two beds, an armchair, and even a semi-private toilet shared with the next compartment. The friendly conductress kept popping in with hot water, tea and coffee (these latter came in sachets described as “3 in 1”, which apparently means that they consist of 50% sugar, 50% powdered milk, and a hint of tea or coffee). 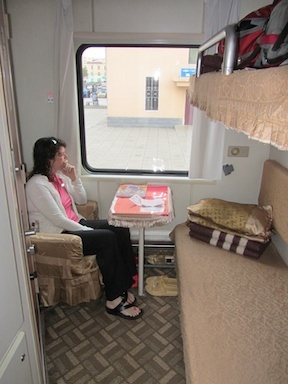 We dozed off the excesses of our final night in Ulaanbaatar as the train climbed up onto the steppe. Waking up hungry, we made our way to the restaurant car. In contrast with the pleasantly homey but food-free Russian restaurant car which had accompanied the train across Siberia, this Mongolian car was quite plain. In place of the two elderly Russian ladies providing plates of potatoes and pickles, were uniformed waiters and chefs, and an extraordinarily expensive menu denominated in US dollars. We ordered one lunch and one breakfast between us, and it came to an astonishing $40, and that was with many of the key ingredients missing. When we first sat down, we explained that we couldn’t eat wheat, and the waiter leapt to the conclusion that we were vegetarians and no amount of argument could get him to change his mind, so we picked at our salad and watched in salivating horror as everybody else tucked into their bacon and chops. Still, at least we got to eat a lot of eggs. The steppe ambled past our window under an enormous sky. A few mines, occasional herds of horses and camels, men with big sticks herding goats, sparse handfuls of yurts, and the odd truck. We whiled away the time reading the train’s magazine, which is hilarious. One long and rambling folk tale seems to have been randomly generated by an online translating engine. It goes on for pages and is completely impenetrable, but peculiarly beguiling as we try to fathom what the original text might have said. At seven in the evening we stopped at the Chinese border, and everything got complicated. Most trains in Eurasia use a standard track width, which allows the interchangeable rolling stock to be mixed and matched along international train routes. 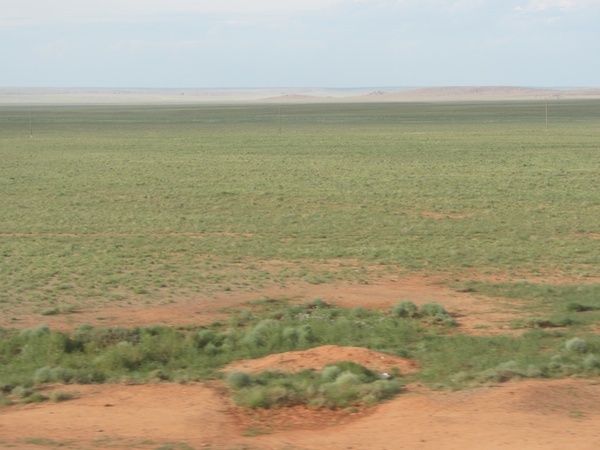 However, Russia and Mongolia use a narrower track to everybody else, so it is not possible for the Trans-Siberian to proceed across the border onto Chinese rails. The rather exciting solution to this problem is to jack up the entire train with everybody aboard, remove the Russian bogies, and replace them with standard ones. Our train was shunted into a large shed and lined up with a series of hydraulic jacks. As the train lifted, men ran around underneath hitting things with hammers until the bogies came free. We understand that in earlier times it was not permitted to watch the process, but on this occasion we were all glued in fascination to the grimy and mud-smeared windows. Once the Russian bogies had come free, they were pushed away, and a new set of Chinese bogies came rushing in, pulled by an underground cable. The whole process took a couple of hours, followed by another hour of banging and shunting as they put the train back together. Immigration was a formality, merely involving glancing at passports and checking the toilets for stowaways, and so we drifted off into a comfortable sleep. Since the restaurant car changes at every border, we were interested to compare the new Chinese restaurant with the Russian and Mongolian ones, particularly as our last meal had been almost protein-free and we were starving. However, when we arrived for breakfast soon after opening, it was packed and we were told to come back at 10am for lunch. There were no platform vendors at the stations, so we quietly hugged our grumbling stomachs and chewed on our last remaining pieces of dry biltong before rushing to the restaurant car precisely on time. The car was empty, and we gorged on two lunches each, crispy chicken and diced breast and peppers and rice and salad and eggs… we were so happy to eat. The price was only 80 yuan (about 8 pounds) including beer. Bronwyn offered to pay the bill using our Mongolian currency which we had forgotten to change at the border, and the price was 80,000 which was somewhat suspiciously exactly the amount that Bronwyn was holding in her hand, and which incidentally was about 80 pounds! We turned down the kind offer and paid in yuan. Our somewhat unreliable guide book had insisted that we get up early if we were not to miss the best of the scenery, but it wasn’t until we had finished lunch that the landscape started to change. The train was running alongside the Guanting Reservoir, a large lake in a deep gorge that seemed to have been lined by white marble terraces, in part to prevent the valley from crumbling into the fields of sweetcorn and sunflowers below. The gorge was scattered with major engineering works, dams and power stations and bridges, all against a backdrop of spectacular mountain peaks, especially as we chugged up through the Badaling and Huyu national parks. Finally after some eight days rolling across Siberia, Mongolia and China on the Trans-Siberian railway, we arrived at our final destination in Beijing. Together with fellow travellers Gar and Tony, we stumbled blinking into the smog-laden sunshine, to find that the queue for taxis stretched clear across the square. The line of overheated and overladen shoppers and tourists snaked obliviously around a tented area of plastic tables, presided over by a smiling man with a portable freezer full of ice and beer. We looked at each other. It seemed rude not to. This entry was posted in Asia, China, Mongolia, Travel and tagged Train on 2012/08/18 by Reinhard.